Human foosball inflatable is a life size foosball game field for both adults and kids. 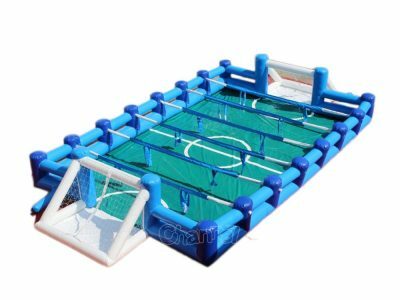 With our inflatable human foosball table, you don’t have to build a foosball court from scratch every time, you just need one or two blowers and few minutes. Human sized table football is definitely a hit for every party and event with a bunch of guests, it is a highly considerable item to add into your inventories of your rental businesses. Channal, as a proficient China inflatable foosball manufacturer, offer best quality human foosball game for sale. Wanna explore other large football inflatables, check out our inflatable football pitch and water soccer inflatable.